While lying on your side with your knees bent, raise the top knee while keeping your feet together. Do not let your pelvis roll back during the lifting movement. Start in a seated position with a ball / towel between your knees and elastic band around your ankles. Squeeze the ball and sustain and hold. Next, tension the band as you move your feet apart from each other. Place a rolled up towel, ball or pillow between your knees and press your knees together so that you squeeze the object firmly. While standing, raise your leg out to the side. Keep your knee straight and maintain your toes pointed forward the entire time. Use your arms for support if needed for balance and safety. Lying on your back with knees bent, slowly lift your bottom and hold. Now lift one leg off the floor and straighten your knee. Lower to start position and repeat raising alternate leg. Variation (Bridge Walking): once raising your bottom, take ten small steps out and ten steps back. While lying on your side with your knees bent, raise your top foot towards the ceiling while keeping your knees together. Do not let your pelvis roll forward during the lifting movement. Start in a crawl position and then raise your leg up behind you as shown. Keep your knee bent at 90 degrees the entire time. While standing up on a step, lower one leg downward towards the floor by tilting your pelvis to the side (don'tbend the knee). Then return the pelvis back to a level position. While standing, move your leg back as shown. Use your arms for support if needed for balance. While standing, draw up your knee, set it down and then alternate to your other side. Use your arms for support if needed for balance and safety. While lying on your side, slowly raise up the bottom leg towards the ceiling. Keep your knee straight. The top leg should be bent and your foot planted on the ground supporting your body. While lying on your side, slowly raise up your top leg to the side. Keep your knee straight and maintain your toes pointed forward the entire time. Stand with feet shoulder width apart and in front of a chair that is facing you, bend your knees and lower your body towards the floor. The chair seat is a guide so that your knees do not pass over your toes. Lean your low back against an exercise ball on a wall. Your feet should be shoulder width apart. Next, slowly bend your knees and lower your buttocks towards the floor. Knees should bend in line with the 2nd toe and not pass the front of the foot. While lying on the floor, place an exercise ball under the heels of your feet. Next, raise up your buttocks and then bend your knees to draw the ball towards your buttocks. Return to start position. 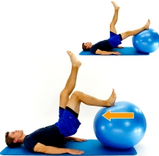 While lying on the floor, place your heel on an exercise ball. Next, raise up your buttocks and then bend your knee to draw the ball towards your buttocks. While lying or sitting, raise up your leg with a straight knee. Keep the opposite knee bent with the foot planted to the ground. Place a rolled up towel or object under your knee and slowly straighten your knee as your raise up your foot (toes pulled back and turned to eleven or one o'clock). While seated with your knee in a bent position, slowly straighten your knee as you raise your foot upwards as shown (toes pulled back and turned to eleven / one o'clock. While lying face down, slowly bend your knee as you bring your foot towards your buttock. Add an ankle weight as appropriate. Start in a standing position with a ball behind your knee and against a wall. The knee should be partially bent. Next, press the back of your knee against the ball, straightening your knee. While standing with both feet on the floor, step up a step with one leg. Return back towards the floor leading with the same leg. Start with your feet shoulder-width apart. Next, bend your knees to approximately 30 degrees of flexion to perform a mini squat as shown. Then, return to original position. Knees should bend in line with the 2nd toe and not pass the front of the foot. Stand on one leg, resting your hands on a table. Bend your knee and lower your body towards the floor. Knee should not pass the front of your foot. Keep your kneecap in line with your second toe. While standing, bend your knee so that your heel moves towards your buttock. While standing, bend your knee taking your heel towards your bottom. Next, kick your foot towards the ground without letting your knee fully straighten. Stand and balance on one leg. Next, lean forward towards touching the floor as you extend and lift your leg behind your body. Return to starting position and repeat. Stand with your feet shoulder-width-apart. Next, take a step forward and allow your front knee to bend. Then, return to original position. Do not let your knee-cap pass your toes. Lunge Slide (variation) - place a hand towel under the lead leg and lunge forward sliding the foot along the ground, then slide back. While standing on the edge of a step with your heels off the back edge, raise up on your toes as you raise your body upward, and then lower as shown. Stand on the edge of a step with your heel off the edge. Next, raise your heel and then lower. While seated, cross your legs and loop an elastic band around your affected foot. Now hook the elastic under your opposite foot and take the band up to your hands. Next, draw your foot inward, keeping your heel in contact with the floor the entire time. While seated, loop an elastic band around your foot. Tie the other end of the elastic band onto a secure surface / object. Draw your foot upward. Be sure to keep your heel in contact with the floor the entire time. While seated, place your foot on a towel and draw it back towards you scrunching your toes. Be sure to keep your heel in contact with the floor the entire time. Loop an elastic band around your affected foot. Now hook the elastic under your opposite foot and take it up to your hands. Next, draw the band outwards to the side keeping your heel in contact with the floor the entire time. While seated, loop an elastic band around your foot. Hold the other end of the elastic band in your hands. Press your foot downward and forward. Be sure to keep your heel in contact with the floor the entire time.